Warm red fleece scarf made from soft easy care fleece. Warm red fleece scarf made from soft easy care fleece. Red polar fleece scarf with tassel ends and stitched sides. Nice length for wrapping, knotting and folding. Warm red fleece scarf made from soft easy care fleece. 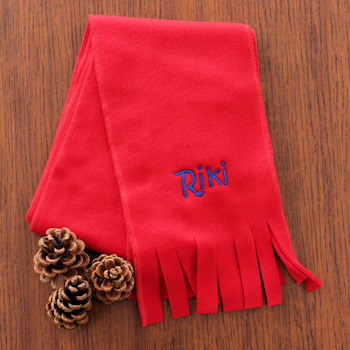 Red polar fleece scarf with tassel ends and stitched sides. Nice length for wrapping, knotting and folding. Cosy and Comfortable fit for boys or girls. Optional to have this scarf personalised with a name or initials of your choice added to one end. Custom embroidered in your choice of font style and thread colour.